I hesitated about posting this photo. But I checked with its author, Mr. T, and he okayed it. This was a slip for our Advent box. A box in which, during Advent, we place slips of paper sharing how we’ve brought light, somehow, to someone else. Mr. T wrote this one. He didn’t fold it in half, so when I opened the box to add a slip of my own one day, this was sitting on top, waiting to charm me. 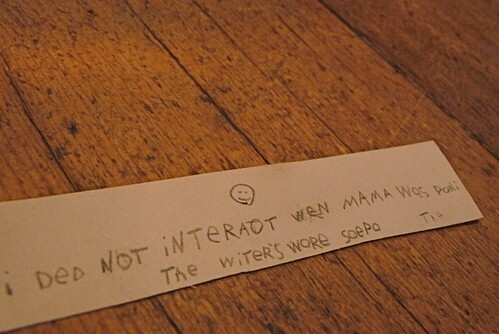 In his own quirky spelling, Mr. T had written I did not interrupt when Mama was doing the Writer’s Workshop. 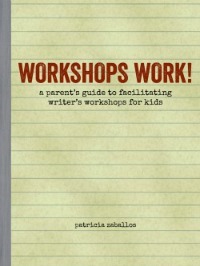 The workshop is something I facilitate for a group of kids who are Lulu’s age. And whenever we meet, Mr. T has to keep himself busy and stay out of the way for two hours. Not always an easy task for an eight-year-old boy, but clearly he recognizes that it helps me when he does. I post the slip here for a few reasons. First, I’m making just two resolutions for the new year. One is to make substantial progress on my book project. 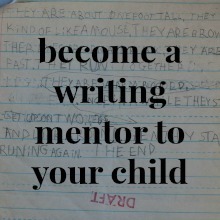 The other, a sort of extension of the first, is to post more often about writing with kids. Because, as you can imagine, I’m fairly immersed in the topic these days. But even more, I want to put other parents at ease when it comes to kids’ writing. Whenever I give workshops on writing, whenever I post here on the topic, whenever I simply find myself in a conversation with other parents about writing, I realize that many parents have a lot of anxiety about kids and writing. And I have a personal mission to help them stop worrying so much. Look at that little slip of paper. Isn’t the spelling a mess? My kid is eight years old; if he went to school he’d be in second grade. I think his teacher might be concerned that he spells doing as doni and shop as soepo. Soepo? Am I worried? Nope. (Noepo?) See, this kid only writes on his own in little bits here and there, when he wants to. On his comics, on lists, for games he’s imagining. Mostly, I write for him, taking dictation. He’s quite a storyteller. With my oldest, I did a fair amount of forcing when it came to writing. And he was the only one of my kids to say he hated writing. (Luckily, he grew out of that frustration before long.) With my younger two, I decided that nothing was worth making them hate something that I loved so dearly. So I took dictation from them and let writing happen more slowly and organically. It’s still happening slowly and organically with Mr. T.
If posting that little slip helps even one parent breathe easier about his or her own kids’ writing, then I’m glad I did it. And I plan to continue writing about writing. 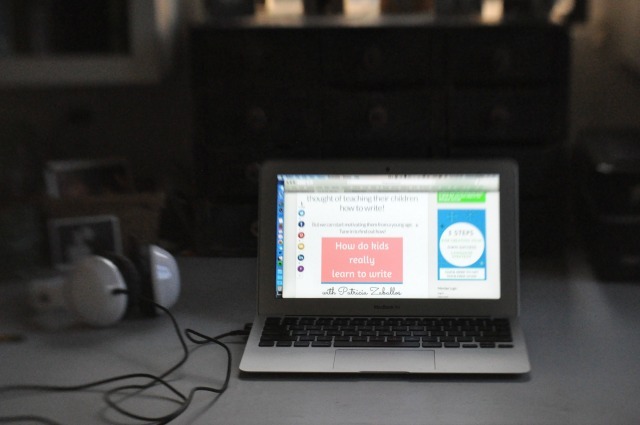 If you have questions or comments about your kids and their writing, let’s start talking here. Because it’s a new year, and I’m a woman with a mission. This is the kind of article I need taped to my refrigerator. Thank you! Oh good, Jane! Now you’ve gone and inspired me to keep writing these posts, in the hopes of wallpapering folks’ refrigerators! This post made me feel so joyful and at ease. And I have to say, that correctly used apostrophe is not an accomplishment to sneeze at (at which to sneeze?). I’ve seen many college students who can’t get the hang of that one! I look forward to more posts from you on writing with children. I’m so glad the post helped, Carrie. I’m guessing that he’s seen me use that writer’s workshop apostrophe somewhere, for him to apply it himself. The fact that the workshop belongs to the writer is sort of abstract. But he does know that you use an apostrophe and an s when something belongs to someone. I never “taught” him that, but he learned it from watching me transcribe his dictation. I never would have noticed his apostrophe if I’d focused on the wonky spelling. Focusing on what they do well, rather than what they do poorly, always helps. In writing, in homeschooling, in life. It’s funny how school thinking can make us equate spelling with writing. Spelling is important, but it’s a mechanic of writing, a minor thing. It’s what we have to say that should matter most. I’m glad you’ve recognized that over-correcting kids just discourages them. Better to spend our energy pointing out what they do effectively! I’ll back you up. Annie (now 17 and a senior in high school, but a homeschooler through 8th grade) did not find her writing self until 14. She *could* write, but it was funky, like T’s, and she preferred to draw and read, draw and read. Fast forward to now, just for reassurance to those in the middle of the movie. She is the only kid getting an A in AP English 4. She came *this* close to 100% on the language portion of the SATs. And her essays will be what gets her in to one or more of the high-falutin’ colleges she’s applied to. That’s not to say every kid will have that experience. I doubt Joe will be the writing super star his sister has become – he doesn’t read much nor enjoy telling stories like his sister (he has other super star potential, though). But if it helps to know, he went to school in 6th grade, and has had no trouble keeping up and functioning well in even a fairly demanding language arts class since then (he’s in 8th grade, now). He just wrote a survey instrument for his science fair project that I was delighted by, and I’ve been designing questionnaires for over 20 years. Oh Susan, thanks so much for sharing. You remember how hard it can be to homeschool with young kids. Especially if the only form of education you know firsthand is the classroom experience of your childhood. It’s hard to have faith that an alternative education–that you’ve never experienced yourself–will work out in the long run. I know it’s reassuring for newer parents to hear from people like you (and me) who can tell them that our kids have nearly made it to adulthood and, yes, it works out. Having a kid nearly ten years after the first has its perks. Mr. T is definitely getting the benefit of a mother who has full faith in his process. That Annie is just awesome. Remember when she doubted her academic abilities? Ha! Isn’t it funny how much time schools have traditionally dedicated to the teaching of penmanship–printing and cursive? And now those skills are quickly becoming obsolete. Even though I’ve seen my eldest grow (mostly) organically as a reader and writer it is still something that tends to make me quietly anxious. My first born is soon to be 11. She really took off at around age 9. Even though I’ve witnessed how well it worked for her, I can’t help but feel those worrying nudges from time to time as my 2nd born, who just turned 8, does so little reading and writing. The intellectual part of me knows not to worry but the emotional side of me wishes from time to time that my kids were early readers & writers. It’s nice to read these reminders. I’m looking forward to more of your posts on this topic. Having an oldest child who takes to reading easily can be a blessing and a curse, can’t it? My oldest is a very visual learner, and he taught himself to read at a young age. As parents we know better than to compare our kids, but still, it’s hard not to. You know you ALWAYS make this homeschooling mama feel better 😉 And I’m glad to hear that “they all get there” from a previous commenter. Thank you for the words of encouragement. …and ummmm, since you opened yourself up for questions…I’ve been wondering what to do about confusion around similar sounding phonetics. Holden interchanges “th” and “s” and “f” pretty frequently, verbally and in his writing. I’m trying to work on it with him but he gets frustrated (as do I). Do you have any suggestions for working through this, or is it something that will just magically work itself out over time? I’m guessing it’s one of those endearing habits that will disappear without you noticing, until the day you realize how much he’s growing up, and how much you miss it. A lot of kids make spelling errors based on their childhood mispronunciations. Which isn’t a bad thing–it shows you that H has the sound/spelling connection down, right? My kids all had little mispronunciations which they outgrew, but I don’t know much about speech therapy or that sort of thing, if you have concerns there. Maybe other commenters do. I’m guessing that when he says the word wrong, you don’t correct it. Because you probably know it’s a developmental thing, that he’ll grow out of it, and that the more you correct it, the bigger an issue it can become. You might correct it if he were in a performance or something where the pronunciation mattered, right? I’d let the spelling evolve the same way. If there’s a reason for the spelling to be correct, help him; if not, let it go and appreciate it for its little-boy charm. Tricia, I had to sneak up on this post and read it in small doses. It is very lovely. And yet…it is bitter for me now. It is an article of homeschooling faith that kids will do things organically and in their own time. And it was this prevailing ethos that made me wait for Clem to organically begin to read and write and not find out earlier that she is among the 1 in 5 children with speech and language learning disabilities that benefit from intensive and early intervention. Some of the commenters above mention traits in their children that are hallmarks of dyslexia. I would urge parents who are concerned about their child’s reading to read this checklist, and a few others and an article or two on dyslexia. Clem has many, but not all of these traits. http://www.dyslexiaaction.org.uk/Page.aspx?PageId=69 If the checklist, instead of bringing a sigh of relief, causes you further worry, read the book Overcoming Dyslexia. For those of you with a 4-in-5 child, please excuse this interruption and return to your regularly scheduled organic homeschooling. Susan, I really appreciate the comment. First, because I don’t have much experience with dyslexia, so I appreciate having a simple resource like the checklist to pass along to folks with concerns. And I think it would be good for me to read the book. Second, I want to be sure that I’m not playing myself as an expert here. I have a fair amount of experience in the classroom, and am a long-time homeschooler. Those are experiences that I want to share, but I don’t mean to portray them as overarching expertise. Your response is a reminder to take care in how I respond to readers, and to make sure I direct them to other resources. The checklist is not perfect. The book has an excellent overview of developmental milestones and what to look for at each stage to see if there are red flags. It would make me very happy that I commented if a blurb on dyslexia made it into your book! Based on our family history of dyslexia I should have been on white hot alert for reading problems in my kids. But I wasn’t and maybe I didn’t even believe dyslexia was real. Recent brain research shows that it is. Thanks for your kind response. i can’t wait to read more posts about writing! and thank you so much for sharing the picture of t’s writing (i’ll admit, when i first saw his little handmade cards on your kitchen island, i thought he had the best penmanship i had ever seen! but then i found out it was your writing). you’ve already helped me tremendously in the worried writing department. since taking a chill pill and stepping back, i’ve discovered all sorts of evidence of writing. as it turns out, a lot of my daughter’s writing happens at night when she’s in bed. i don’t necessarily get to see her writing, but if i pop in to say goodnight one more time, i get to see her in the act of writing. See, my friend, you’ve made it over the biggest hurdle of all: she wants to write! If they want to write, and if they spend time writing, they’ll become better writers. Works the same way with adults. Oh Patricia, this post was one big deep breath. Thanks! Well, it seems like you already have one writer well on her way, right? I do, I think–but I also think that it’s pretty much impossible not to worry, at least for me. Reminders to breathe are always welcome! oh, and can you remind me not to panic about math, either??? I will say that what’s worked for us is to take a smorgasbord approach when the kids are younger (say elementary school aged, and even junior high age). I make sure they’re doing math of some sort on a fairly regular basis–although I haven’t done much formal math with Mr. T since November, if that makes you feel better. Time to start up again! We use a real mix of things: games, literature books on math topics, activities from various math resource books, workbooks occasionally, and especially the math that comes up in everyday life–and their own projects. If they don’t like what they’re doing, we shift gears. I don’t think it’s so important to have a linear, all-from-one-textbook, make-sure-they’re-covering-every-last-math-topic sort of education. Especially when they’re younger. My older two fought learning complicated math algorithms–borrowing, carrying, etc. but they could deal with large numbers in ways that made sense to them. I was fine with that (or at least I was after struggling over it with my oldest for quite a while!) To me, it’s more important that they’re playing with math ideas regularly, and they’re willing to tackle all sorts of problems. H went from that kind of background to doing fine in high school math (B+ and A- work from a kid who has never particularly enjoyed math.) And Lulu is right now studying for a high school placement test. She feels like she has some holes in her math education, as far as what will be on the test. But she sure seems to be picking up the holes and stitching them closed pretty quickly! She probably won’t qualify for honors math–but math isn’t her particular interest either. She’ll be just fine. And here are a couple of resources I like, because I can’t stop myself from sharing resources. See what happens when you get me started? Thanks, all. Holden displays a few traits on the dyslexia checklist, but it seems he’s too young to know for sure (he’ll be 6 next month). He’s grown out of a few traits, but dyslexia is on the backburner of my mind. I’ll bring it up at his 6 year checkup. And thank you, Patricia, for opening this discussion. I love having the wisdom of tried-and-true homeschoolers like yourself at hand. my oldest is only 3, so still too young to even begin worrying about this kind of thing. he likes to pretend to write and he can spell his name if you ask but beyond writing the letter H (for his name) he has no interest whatsoever. and that is okay with me. in the meantime though, posts like this help me be confident in my thinking that i won’t be worried and will have no need to be. even when the pressure comes on from the grandparents. and oh! it will. I needed to look at your old posts on spelling tonight, Patricia. My eight-year-old has started going to a part-time Montessori “school for homeschoolers” that is motivating her to write more things for herself. I find myself both incredibly moved by the expressiveness and the natural voice of her writing and cringing at the very idiosyncratic invented spelling and total lack of punctuation. I DO trust the process. I really, really do. But it’s hard to just sit back and let her go out into the world with her writing and hope that others will be kind and encouraging. But she really, really wanted to try this school. I do get a good feeling from her teachers and will refer them directly to your blog if they gimme any grief about not correcting her spelling or insisting on perfect punctuation. Thanks for helping me once again! Oh, thanks, Patricia, the post you linked to above was the one I was particularly looking for and couldn’t locate last night. Thank you so much! I feel really reassured, as always, by your blog.